Welcome to our page of information, attractions and places of interest around Totnes. Totnes is an ancient market town and enjoys a prominent position on the Dart estuary. Totnes has busy narrow streets, dominated by the castle and church tower. Totnes has a full range of shops and banks, pubs & restaurants around the main streets and is full of interesting diversions for the visitor, with fine examples of properties dating back to Norman, Medieval and Tudor times. Visitors to Totnes can take a boat trip from the Quay to the historic town of Dartmouth, 6 miles down stream. 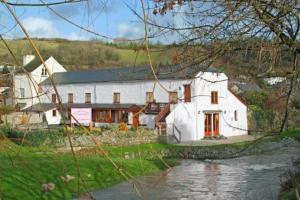 If you are in the right town but cannot find the accommodation you want on this page, you might consider Totnes hotels. Also see Totnes & Totnes attractions. Bed and breakfast in Totnes. Location: In the centre of Totnes. This centuries-old coaching in at the top of the town offers comfortable accommodation in its newly-refurbished rooms. There is a double en-suite room, a twin room with private bathroom and a lovely room with a four-poster bed, which also has a private bathroom. A fourth bedroom, which will be a large double en-suite room, will be available in time for Easter. Home-cooked breakfasts consist of cereal, fruit, yoghurt, a full cooked English breakfast, toast and marmalade or preserve, orange juice and tea or coffee. We can usually cater for any special diet requests, including vegetarian and gluten-free. For bed and breakfast accommodation in other areas near to Totnes Devon see Bed and breakfast in Dawlish & Bed and breakfast in Paignton.